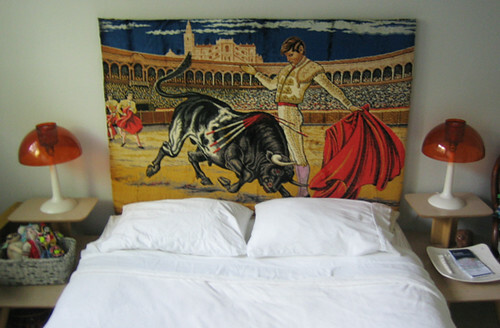 Be the envy of all your guests with this spectacular padded queen-size-bullfight headboard. Have your eyes ever beheld such a site? I thinkith not. Imagine seeing this everyday. In person. Sweet dreams, right? I'm selling the headboard, which could just be used as a wallhanging, for $80 and the pair of side tables (sorry for the bad picture) for $50 (that's $50 for the pair). The lamps are staying. Booya.